I just finished the 1970 edition of Sheilah Grahams book “The Garden of Allah” (The story of Holywood`s most exotic playground featuring the famous & infamous superstars that created the legend). The well known Hollywod columnist and companion of F.Scott Fitzgerald lived next door to Errol`s villa in the appartement complex and secret hideaway to many stars like Garbo, Bogart and the Marx Brothers. After a public fallout with Pat Wymore, Errol was served the divorce papers there, which resulted in a spontanous dance of joy around the pool by one hopeful future Mrs. Flynn, Beverly Aadland – barely covered by a towel. In the years prior with Pat staying on in Spain, former Garden owner Frank Ehrhart recalled Errol going by a strict regimen: At 12.30 his sectretary would place a chaise lounge by the pool, alongside a table with a bottle of champagne and two glasses. At one o`clock the baron would appear in a blue blazer with white or grey pants and an ascot instead of a tie. He would ask one of the many beautiful girls, be it aspiring actress or starry eyed starlet, if she minded sitting next him. Then he would say: “My child, will you have a glass of champagne?” By then all eyes were on them wondering how long it would take Errol to get the girl into his bungalow. After appearing on the $64.000 question show in New York, where he won $34.000 (one question short of the jackpot), Errol was asked by Ehrhart why he hadn`t gone all the way. Errol smiled broadly. “Frank, he explained, “they garanteed me $32.000 under the table. It was all fixed.” He concluded modestely, “Although I knew all the answers.” Indeed the show was canceled shortly afterward, but only when the cheating on “21” was exposed. When the garden of Allah compound was closed in 1959, a public auction was held and guess what of all the fixtures and furnishings went first? It was… Errol`s bed! I am based at Queen’s University Marine Laboratory Portaferry County Down. I noted a couple of times on the pages about TT Flynn that Queen’s University Dublin was given as his place of work – this should be Belfast. He had a holiday home on the west shore of Strangford Lough (still standing). The present QML buildings have expanded greatly since his time in Portaferry. There were some elderly people in Portaferry who told me that Errol used to visit the area while his father was Prof. of Biology in Belfast. Have you any evidence of the son’s visits to Kilklief (holiday house), Portaferry (marine laboratory / classes), Strangford Lough? 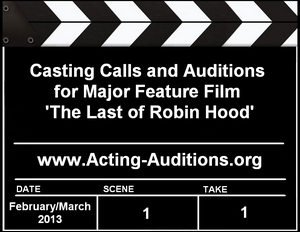 Big Indie Pictures in association with Killer Films is going into production next week on the true story feature film “The Last of Robin Hood”. Filming is taking place in Atlanta, GA through March, 2013. February 2013 Rock-itt Magazine is now online! The February issue of The Rock-itt is now available online. Click the link to take you straight there to catch up with the latest music, entertainment and sport on the Northern Beaches.